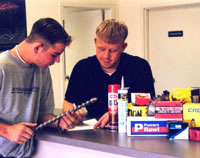 HK Fastener wants to continue to provide better service to our customers than any competitor. We need your input to achieve this goal. Please complete the survey below and help us maintain our position as the best supplier in Central Texas. Required information is indicated by the symbol "*." If you are not satisfied, we will contact you and ensure that your future dealings with us are to your satisfaction. Timeliness of processing and receipt of order? Professionalism and courtesy of our delivery personnel? Professionalism and courtesy of our customer service staff? Knowledge and assistance provided by our sales and warehouse staff? Please provide any additional suggestions or comments below.